Historic Brattonsville presents the history of the Scots-Irish or Ulster-Scots in the South Carolina upcountry largely through preserving and interpreting the story of the Bratton family. Featuring more than 30 historic structures from the 1760s to the late 19th century, the site provides visitors with an opportunity to see the evolution of Southern culture and architecture in the South Carolina Piedmont. In 1971 the Colonel William Bratton House and the Homestead House were listed on the National Register of Historic Places. Restoration of the Homestead began in 1975 and it was opened to the public a year later. Since 1998 Historic Brattonsville has been a part of the York County Culture and Heritage Museums. After 1915 Brattonsville continued in operation for several decades under the stewardship of a series of tenant farmers who worked for the Bratton family. In 1958, a retired IBM manager named R. Fisher Draper purchased 630 acres, which included Hightower Hall, from the heirs of John Simpson Bratton Jr. In 1962 he obtained the property that included the Col. William Bratton House. About the same time, a York County judge and former state legislator, Samuel Mendenhall, purchased Napoleon Bratton’s old estate, including the Brick House and the Bratton Store. Senator Mendenhall spearheaded an effort to have Brattonsville designated as a historic district and helped establish the York County Historical Commission to manage the property. In 1963 the Col. Bratton House was placed in the care of the Historical Commission, and in 1971 the Brattonsville Historic District was officially created with Joe Rainey as its first director. This Historic District included the Col. Bratton House, the Homestead, the Brick House and Forest Hall (now called Hightower Hall), and was placed on the National Register of Historic Places that same year. “Over the next two decades the Historical Commission obtained control of much of Brattonsville, either through gift, purchase or lease, and Brattonsville was officially renamed “Historic Brattonsville” and opened to the public. In 1994 the York County government purchased 435 acres of the R. F. Draper estate which included Hightower Hall, and in 2001 the 55-acre Mendenhall tract was purchased by the county as well. The Homestead House remains in the possession of the descendants of Dr. Rufus Bratton and is operated by the York County Culture and Heritage Commission under a perpetual lease. 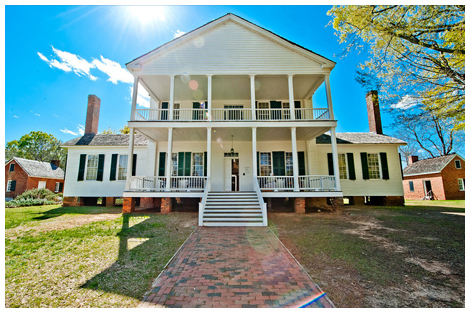 Historic Brattonsville® exists today as a 775-acre, internationally known historical site, and is one of the most important and heavily visited cultural attractions in South Carolina. It stands as a testament to the pioneering spirit and industry of the Bratton family, and to the hard work and sacrifice of their descendants and slaves.